Coronary artery bypass graft (CABG) is surgery to treat coronary artery disease. The surgery helps blood make a detour, or bypass, around one or more narrowed or blocked coronary arteries. 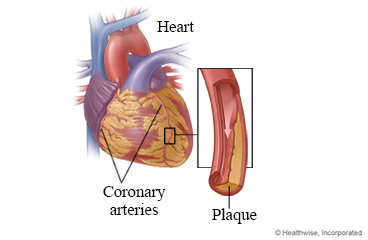 Coronary arteries are the blood vessels that bring blood to the heart. This surgery is also called coronary artery bypass or bypass surgery. Your doctor will create a bypass using a healthy piece of blood vessel from another part of your body. Then he or she will attach, or graft, the healthy blood vessel to the narrowed or blocked artery. The new blood vessel bypasses the diseased artery to increase blood flow to the heart muscle. The doctor will make a cut in the skin over your breastbone (sternum). This cut is called an incision. Then the doctor will cut through your sternum to reach your heart and coronary arteries. The doctor may connect you to a heart-lung bypass machine. It adds oxygen to the blood and moves the blood through the body. This machine will allow the doctor to stop your heartbeat while he or she works on your arteries. The doctor will use blood vessels from your chest, arm, or leg to bypass the narrowed or blocked parts of your arteries. When the blood vessels are in place, the doctor will restart your heart. In some cases, the doctor may be able to do the operation without using a heart-lung machine. This is called "off-pump" surgery. The doctor will use wire to put your sternum back together, and stitches or staples to close the incisions in the skin over your sternum and where your healthy blood vessel was taken. The wire will stay in your chest. The incisions will leave scars that may become less noticeable with time. You will stay in the hospital for 3 to 8 days after surgery. You will probably be able to do many of your usual activities after 4 to 6 weeks. But for 2 to 3 months you will not be able to lift heavy objects or do activities that strain your chest or upper arm muscles. At first you may notice that you get tired easily and need to rest often. It may take 1 to 2 months before your energy is back to normal. Cut back or quit alcohol. Do not smoke. Smoking can make your coronary artery disease worse. If you need help quitting, talk to your doctor about stop-smoking programs and medicines. These can increase your chances of quitting for good. The surgery will take about 3 to 6 hours. This depends on the number of arteries that are bypassed and the type of surgery you have. As you wake up in the ICU, the nurse will check to be sure you are stable and comfortable. It is important for you to let your doctor and nurse know how you feel and ask questions about any concerns you may have. You will be given more specific instructions about recovering from your surgery. They will cover things like medicines, diet, wound care, follow-up care, cardiac rehab, driving, and getting back to your normal routine. Enter X849 in the search box to learn more about "Coronary Artery Bypass Graft: Before Your Surgery".